If time is a flat circle, the obsession to uncover the darkest corners of the nightmares in our culture yesterday, today and tomorrow is futile. The first season of HBO’s eight-episode drama True Detective ignited high public interest before the pilot episode aired. With an 11 million-view count, the highly anticipated finale caused the great crash of HBO Go due to the overwhelming fan base wanting resolution behind the gruesome mystery of Carcosa. Written by novelist Nic Pizzolatto and directed by Cary Joji Fukunago the series focuses on Detectives Rustin Cohle (Matthew McConaughey) and Martin Hart (Woody Harrelson) as they investigate the brutal, ritualistic murder of a woman in 1995. The two are reunited 17 years later by two other detectives trying to solve an identical murder suggesting the original killer from 1995 is still alive. 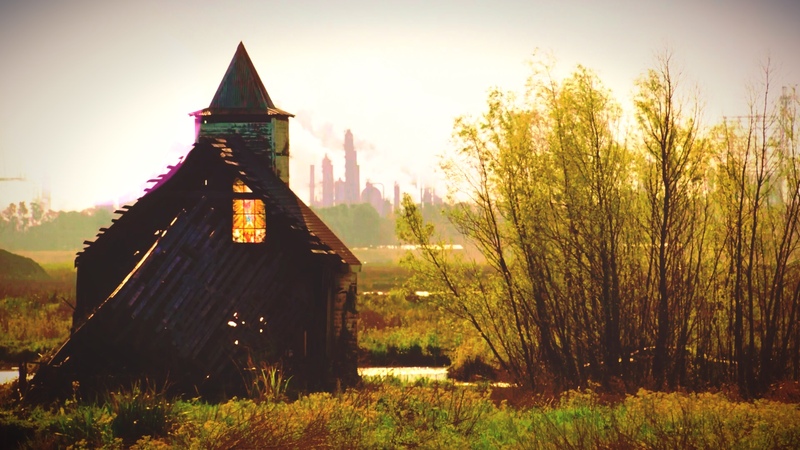 Poetically stylized and hauntingly menacing in the broad, tranquil grounds of rural Louisiana, True Detective far exceeds the procedural crime drama. It’s an investigation into the human character; searching for a creature you can’t see and hails on a dark philosophy suggesting that humanity is an error of evolution. 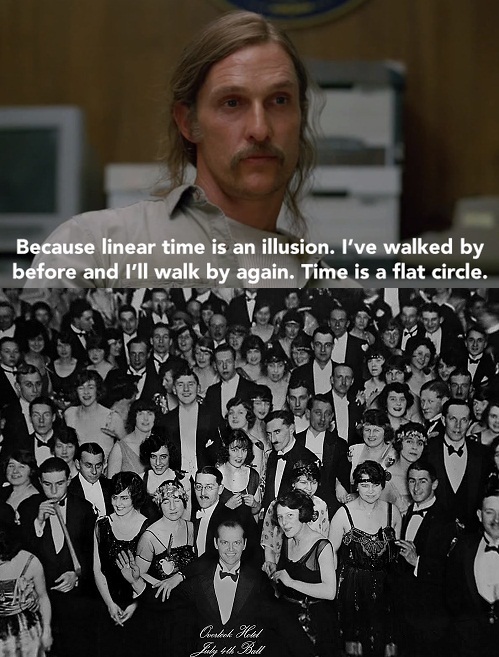 The philosophical backbone behind True Detectives seems to go far deeper than the pages of the script. Inspiration, influences and theories have been identified to be in direct correlation with the storyline, or, at least, may have influenced writer Nic Pizzolatto. But beyond the theories that may have influenced the show, and also aided in revealing the grim world we live in, True Detective novelist Nic Pizzalatto carries the secret behind the subtext of his work. If it’s stories Pizzalatto wants us to focus on questioning our faith, existence and purpose, theories jumping passed supernatural thinking into supernatural beings goes against what Pizzalatto is trying to project. Can you tell me anything at all about season 2? Nic Pizzolatto: Okay. This is really early, but I’ll tell you (it’s about) hard women, bad men and the secret occult history of the United States transportation system. Nic Pizzolatto: I don’t want to restrict an audience by telling them that “this means this” and “this means this.” My intentions are the inalterable definition of things. For people who thought Cohle’s philosophy was simply hogwash, be aware that you’re calling Arthur Schopenhauer and Friedrich Nietzsche hogwash. Just be aware of that. That is not, in fact, a college freshman stoned eating a pizza talking about life; that’s Arthur Schopenhauer’s thoughts on life. But I thought that was part of the tension within Cohle. It might not all fall into relief until you’ve watched all eight episodes, but yes, these things are eloquently stated, and they do make sense, and they are no more or less true than the story Preacher Theriot is telling you during the tent revival service. Somebody asked me, “Well, what does this all mean?” Obviously, as an artist, I hate questions like that, but I could tell they were asking for a governing theme that could encompass everything else that happened. And so I had to think about it. And to me, if there’s one governing thing in “True Detective” that encompasses everything that is happening in “True Detective,” and that the show is telling you — constantly, the show keeps telling you — is that everything is a story. 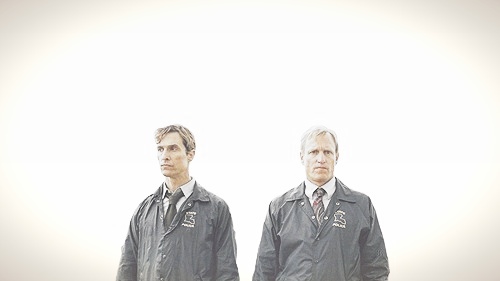 Cohle tells you that who you think you are, your identity, is a story you tell yourself. He tells us that religion and philosophy are stories we tell ourselves. 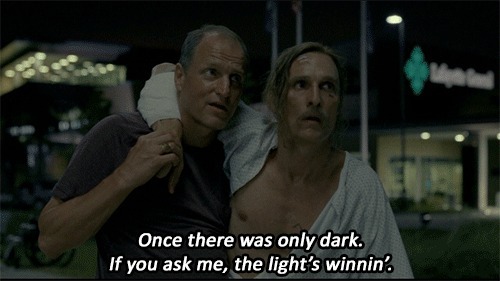 Cohle describes them as cathartic narratives, but in confession he’s so good at getting confessions from suspects because he gives them room to create a cathartic narrative. Hart says an investigation is the act of trying to put together a story after the fact, and when he goes over his story in episode 5, you can tell that Hart used to tell himself one story and now he tells himself another story. The show was never concerned with the supernatural, but it was concerned with supernatural thought, and it was concerned with supernatural thinking to the degree that it was concerned with storytelling. So if there was one overarching theme to “True Detective,” I would say it was that as human beings, we are nothing but the stories we live and die by — so you’d better be careful what stories you tell yourself. Outside of the questions, debates and theories, one thing is certain–this is grade-A work. From the haunting character of rural Louisiana that is as serene as it is haunting as the eyes of our mystery, to the best performances given by McConaughey and Harrelson, it’s hard to find error on any level. Let’s bypass the Emmy’s and instate a new law that awards True Detective with everything. Oscars and fun coupons for everyone involved! Despite McConaughey’s fling with disasterous romantic comedies of the past, his 2014 Oscar along with a great list of more serious roles from the past few years, has solidified him at the top. Now I can firmly believe in his craft and appreciate that there is no challenge he can’t meet with any given character. Truly a great show. The ending disappointed me a bit, but everything leading up to it was pretty awesome nonetheless. Nice post! Thanks! I read that a lot of people were disappointed, but I have yet to understand why? What conclusion were you looking for? I thought it wrapped up together well. I felt like it was too neat and tidy. Maybe too much for what had already been hyped-up for so damn long. I don’t know. Maybe it’s just me. case to present day. The case/mystery was really a backdrop and vehicle to progress the characters. Thought it was the best series on television since “The Soprano’s”. Matt and Woody’s back and forth dialogue locked me in. The story was tremendous, but the episode where Woody’s wife entices Matt just to get back at her husband was stunning. Who saw that coming? You are right; an emmy alone will not do the actors or this series justice. Thank you! There was so much depth to the show that I could have written something entirely on the characters of the show. This is a great post! I like how you thought of the show in a more deeper context, which it should be. While watching the finale I was a bit disappointed because I wanted to know more about the killings, but the last few scenes changed my mind. It’s the characters that really mattered and that I cared for, not so much the crimes. Thank you! There’s a lot to digest with True Detective, and the forums following the show are endless! Holy hell this is a great write up. I loved everything about the show – from start to finish, thought it was perfect. I really enjoyed those extended quotes from Pizzalatto. They helped add some perspective to things, which, in the case of this show, is a very welcome thing. Great job! Thanks so much, Alex! Reading interviews with Pizzalatto gave me a much greater sense of clarity, because I had a lot of questions initially once it wrapped…his quotes definitely pointed me in a different direction of focus. Excellent post for an excellent show! Seriously, great job. I absolutely loved the first season, and I can’t wait to see what comes next. It’s going to be so hard to follow. Thanks, girl! I also read somewhere about SoCal being the rumored location for season 2. Not sure how that will look, but we’ll see! Oh, excellent write up, well done! I’m really hoping they get some awesome actresses for season 2, hopefully Winona Ryder – she needs a proper comeback! Oh my God…stop everything. Is Winona rumored???? That would be so victorious for us ❤ and her. I loved the show, and I also thorough enjoyed this piece of yours, Courtney. It makes me want to re-watch it, now having more information & a better perspective. Well done!